Please Understand Me: A Patientâ€™s Perspective on Psychosis and Its Treatment provides insights you can use to improve patientsâ€™ lives. Lisa Zoetewey has been hospitalized involuntarily in three different institutions. She understands that most caregivers do not know what it is like to be in a psychiatric patientâ€™s shoes. Involuntary treatment can be traumatic. Itâ€™s normal to feel unsafe in the ward and threatened by anyone who dismisses or contradicts the patientâ€™s delusions. It seems like everyone is trying to control the patients, forcing them to take medication and monitoring their behavior and blaming them for actions that under normal circumstances would be considered inappropriate. But these arenâ€™t normal circumstances. Lisa explains why a patient would want to go off medication and explores the consequences of being labelled â€œmentally ill.â€ She discusses when and who to tell about the patientâ€™s illness. And she provides suggestions as to how to handle patients better. One recurring recommendation is to focus on how the patients are feeling and how you can make them feel better, even if the solutions you end up using may be unconventional. 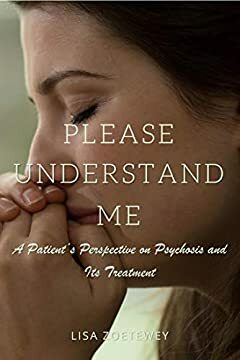 Please Understand Me provides compelling insights into one patientâ€™s experience with psychosis and its treatment, insights you can use to better care for your loved ones and patients.